No matter what your occasion our ICE chairs, chiffon drops and chair embellishments will transform your room and make it look extra special. To soften the ambience of your room you can add our stunning chiffon drops and a gorgeous brooches to complete the look. You will receive a consultation where we discuss your ideas, colour themes and dreams. We have a limited supply of ICE chairs and they are increasingly popular so please check availability for your date as early as possible. 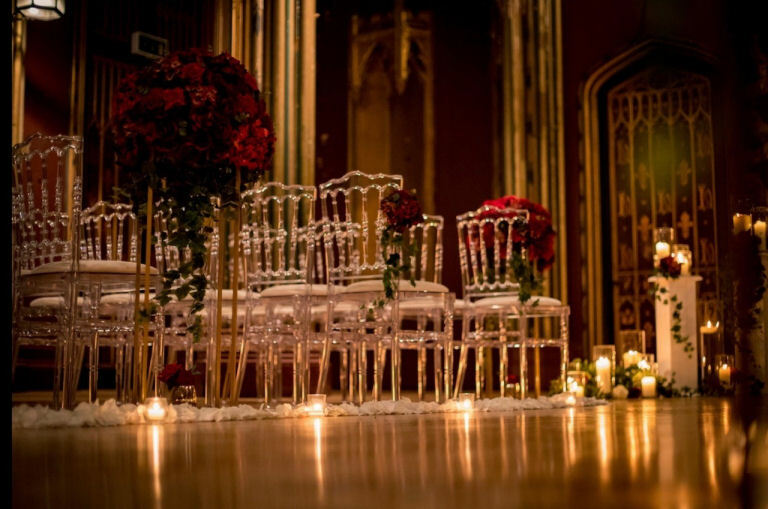 Complete the look of your chairs with our chiffon drops, brooches and silk floral designs. Take a look at our photo gallery for ideas. Let us know if you have any questions or if you have seen something you would like us to recreate for you. We love a challenge and enjoy creating new designs. Our aim is to make your day both beautiful and stress free. We will personally style your room on your day so you can be confident that your venue will be perfectly set up and ready for your arrival. Contact us today for availability and any other enquiries.